The ATTanalyzer is a compact, portable device to aid in commissioning tests of gas-insulated switchgear (GIS) systems. The stand-alone unit connects over fiber optic cables to up to sixteen externally mounted sensors, which are distributed over the GIS system. If a fault or a spark occurs under high voltage, the acoustic sensors pick it up and transmit to the device. It compares the signal travel times from the sensors to determine the location of the GIS fault. The small external sensors of the ATTanalyzer are simple to install and remove. After an initial fault location using the unit, the sensors can be repositioned closer together to locate the fault again with increased precision if needed. It can store up to 16 different fault events. Settings and options are controlled through pushbuttons and on-screen menus. This product is designed to be a simple, cost-effective means of locating faults in GIS, eliminating lengthy and costly delays in repair and commissioning. 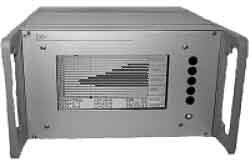 Power Diagnostix Systems GmbH, Bruesseler Ring 95a, 52074 Aachen. Tel: +49-241-74927; Fax: +49-241-79521.